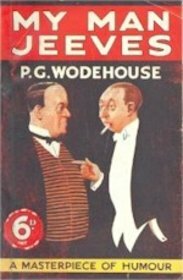 A early collection of Wodehouse short stories, now in the public domain1. There are eight short stories here, four of which are very early Jeeves & Wooster stories, the other four feature Reggie Pepper, who is obviously an early draft of Wooster, sans Jeeves. The Reggie Pepper stories have their odd moments, but Wooster without Jeeves is quickly tiresome and clearly out of balance. The Jeeves stories are narrated by Wooster in a light, collegial tone with a double-helping of jazz-age aristocratic colloquialisms. Wooster is a member of the English idle classes, in a world of school chums, country houses, perhaps a show after dinner at the Drone’s club. Wooster isn’t particularly sharp, but the bulk of the young men in these stories are even duller, stumbling into money trouble or (more often) a problem of how to attract an engagement or escape from one. They all come to Wooster, but they come for Jeeves. Jeeves is Wooster’s personal valet, with his own preposterous language. Where Wooster’s exposition is a meandering jaunt around the park, Jeeves is stiff and precise in an equivalently roundabout way. The prime charm, at least in these early stories, is the spousal dialogue between these two; it is extravagantly wrought. Wodehouse apparently came to plotting late, and the plotting in these stories is pretty thin. I’ve been somewhat spoiled, in that I had watched these stories in season three of Clive Exton’s excellent TV adaptation2. Exton took several of these stories and intertwined and even connected them, while retaining the bulk of the admirable dialogue in place. Stripped and split pea like this, they feel a thin soup indeed. All four Jeeves stories are worth it for the dialogue. The Reggie Pepper stories are interesting as a precursor, but to channel Wooster for a moment: if I read them again, I wouldn’t, if you see what I mean. Available from Project Gutenberg, I read it on a Kobo. Exton's series is great, but these stories all take place in New York rather than London or the English country side, and the obvious production challenges make these episodes pretty claustrophobic and a bit dull.